Epcot come to life with color... It makes visiting one of our favorite parks, even that much better. Disney's hard work and planning show! My husband and I are amazed with each special garden, and topiary that we come across. When the Flower and Garden festival is on, I feel like I cannot get enough of it. Each day we are here exploring and learning new things and getting ideas for when we go back home! The bonsai trees in Japan and China are amazing, as well as the fragrance gardens and outdoor patios to wonder through. Just when you think you've seen it all, you come across more. This festival is one that cannot be missed and one that we so appreciate. This event is a nice addition to EPCOT in the spring. The dispalays are beautiful, the workshops somewhat interesting. My favorite part has to be all the Disney character topiaries. Fun to see so many in one place. When planning when to go to Disney World, the 4 times i have been i had always thought it would be neat to go, but it never meant that much to me...i recently went for my very sweet 16 (5/20-5/25 2002)and it was PURE magic!!!!! it is absoultly undescribale!! February 28 to May 28 2018. March 2 2016 to May 30 2016. March 4 2015 to May 17 2015. March 5 2014 to May 18 2014. View the full menus for all the Outdoor Kitchen food and drink kiosks around World Showcase. Showtimes are Friday, Saturday & Sunday at 5:30pm, 6:45pm and 8:00pm. The Flower Power Concert Series is included with Epcot admission. Performers are subject to change. View the full menus for all 12 of the Garden Marketplace food and drink kiosks around World Showcase. At the America Gardens Theatre in World Showcase on Fridays, Saturdays and Sundays at 5:30pm, 6:45pm and 8:00pm. March 4 - 6 Jose Feliciano - "Light My Fire"
March 11 - 13 The Guess Who - "These Eyes"
March 18 - 20 Chubby Checker & The Wildcats - "The Twist"
March 25 - 27 Melissa Manchester (New for 2011) - "Don't Cry Outloud"
April 1 - 3 Starship Starring Mickey Thomas - "We Built This City"
April 8 - 10 Marilyn McCoo & Billy Davis Jr. (New for 2011) - "You Don't Have to be a Star"
April 15 - 17 Juice Newton (New for 2011) - "Playing with the Queen of Hearts"
April 22 - 24 Ricky Nelson Remembered featuring The Nelsons - "(Can’t Live Without Your) Love and Affection"
April 29 - 5/1 Paul Revere and the Raiders - "I'm Not Your Stepping Stone"
May 6 - 8 Davy Jones - "Daydream Believer"
May 13 - 15 Herman's Hermits starring Peter Noone - "Henry the VIII"
The heroes of “Toy Story 3” have left the toy box. Woody and Buzz Lightyear meet arch-enemy Lotso the teddy bear on the Future World playground for the 18th Epcot International Flower & Garden Festival March 2 through May 15, 2011, at Walt Disney World Resort. The popular Disney•Pixar characters hit the sandbox as seven- and eight-foot-tall topiaries at the Epcot front entrance flower bed featuring a sand castle, strawberry-scented field and playground toys. Created by Disney gardeners and topiary experts with bold strokes of seasonal color, the topiary display marks the first time that “Toy Story” characters have been featured at the festival. It’s also the first time in seven years that the front-entrance floral spectacle showcases all-new topiary characters, says festival horticulture manager Eric Darden. This year’s festival showcases more than 100 expertly crafted topiaries, and another show-stopper will be the brand-new “Cars 2” display at the World Showcase plaza, Darden says. Large floral topiaries of “Cars” characters Mater and Lightning McQueen will park their colorful chassis beneath a black-and-white checkered arch. To complete the scene, gardeners will create floral flags representing Japan, France, Italy and the United Kingdom – destinations of the car characters in the sequel due in theaters June 24. And Winnie the Pooh, Tigger and pals appear in topiary splendor among a Hundred Acre Wood wildflower display between Future World and World Showcase. They’re just in time to spread the happy news about the “Winnie the Pooh Movie” debuting summer 2011. · A roomier-than-ever Bambi’s Butterfly House grows three-fold this year in its new location along Imagination Walkway by Innoventions West in Future World. It’s the first time the popular garden has expanded since its 2005 debut, and guests will see more butterflies than ever, Darden says. · The Healthy Living Garden invites park guests to join in fun activities designed for improving their health and well being. Areas of the garden, presented by Syngenta, focus on healthful eating, fitness, relaxation and meditation. An adjacent children’s play area keeps it all in the family. · A new Festival Center stage brings nationally recognized garden personalities to the festival twice daily. · Rapunzel lets down her hair at Rapunzel’s Tower in the Tangled Magical Garden inspired by Walt Disney Pictures’ animated film, “Tangled,” located between the Germany and Italy pavilions. · Flower Power grows with new-to-the-festival pop acts. Melissa Manchester, March 25-27 (Don’t Cry Out Loud), Marilyn McCoo & Billy Davis Jr., April 8-10 (You Don’t Have to Be a Star) and Juice Newton April 15-17 (Playing with the Queen of Hearts) are set to light up America Gardens Theatre with their timeless tunes. · A new Festival Special Weekend is slated for May when Disney?Pixar presents a Pixar Animation Studios celebration in conjunction with the upcoming “Cars 2” big-screen debut set for June 24. · Flower Power concerts – Popular bands will rock the open-air America Gardens Theatre every Friday, Saturday and Sunday at 5:15, 6:30 and 7:45 p.m. Jose Feliciano is scheduled to kick off the concert series March 4-6. The Flower Power lineup also will feature pop favorites such as Davy Jones, Chubby Checker & The Wildcats, and Paul Revere & the Raiders. · The Festival Center– Guests can shop for festival merchandise, attend demonstrations and get ideas and tips from master gardeners. Includes Disney Gardening at Home and other presentations. · Pixie Hollow Fairy Garden –Fabulous Disney fairies alight to greet young fans who enter this whimsical garden designed with play structures for children ages 2-5. · Special Festival Weekend Celebrations – An Art in the Garden celebration of plein air artists is scheduled March 25-27; the popular I Dig Bugs event is set for April 15-17; and a Fresh from Florida Farmer’s Market salute is slated for April 29-May 1. A date will be announced for the May Disney?Pixar weekend celebration. The 17th annual Epcot International Flower & Garden Festival kicks off March 3 – earlier than ever – and continues for 75 days through May 16, 2010, with bold strokes of seasonal color and brand-new topiary whimsy. Last year’s festival began March 18; now Walt Disney World guests get a head start on the gardening season as they explore exhibits and activities geared toward discovery and outdoor fun. New Victory Garden – Disney’s “fab five” topiary pals – Mickey, Minnie, Donald, Pluto and Goofy – gather at American Adventure to tend tomatoes, beans, peppers, herbs and other edibles in their first Victory Garden as a salute to the history of World War II gardens, the new White House vegetable garden and the many community gardens being planted across the country. Newly Expanded Pixie Hollow Fairy Garden – Colorful topiaries of Tinker Bell and friends from Walt Disney Pictures’ latest DVD release “Tinker Bell and the Lost Treasure” will sprinkle pixie dust over this playful, expanded garden for kids. New characters on display with returning fairy favorites are fast-flying, sharp-tongued Vidia and charming Terence, dispenser of pixie dust. Tinker Bell’s Nook has hands-on activities. In a synergistic turn, the “Lost Treasure” DVD includes a bonus feature on “The Making of the Fairy Garden,” featuring Disney cast members who designed and built Pixie Hollow, along with the movie’s producer and director, who helped plan the garden. First-Ever American Gothic Mickey Mouse and Minnie Mouse – Topiary experts pull out all the stops to create an American Gothic Mickey and Minnie topiary scene based on the 1930 Grant Wood painting. At World Showcase Plaza. Pirates Adventure Zone – Peter Pan, Captain Hook and Croc topiaries will lure young swashbucklers to this interactive space designed for exploration and adventure. Next to the Germany pavilion. Flower Power concerts – Popular bands will rock the open-air America Gardens Theatre every Friday, Saturday and Sunday at 5:15, 6:30 and 7:45 p.m. Jose Feliciano is scheduled to kick off the concert series March 5-7. On subsequent weekends, the lineup is slated to feature pop favorites like Davy Jones, Chubby Checker & The Wildcats, Tony Orlando, former Boston lead singer Fran Cosmo, and other top acts. The Great American Gardeners series – Gardening celebrities and authors from across the country will reveal their gardening secrets. Opening weekend, Robert Bowden, author and director of lush Harry P. Leu Gardens in Orlando, kicks off the series. The Garden Town Festival Center – Guests can shop for festival merchandise, attend speaker presentations and demonstrations and ask gardening questions of the experts. Special Festival Celebrations – An Art in the Garden celebration of plein air artists is scheduled March 26-28; a Florida Farmer’s Market celebration is April 23-25, and the popular I Dig Bugs event is set for April 30-May 2. Cinderella and Prince Charming, Snow White and the seven dwarfs, Sleeping Beauty and Prince Phillip, and Belle and Beast from “Beauty and the Beast” will debut as the grand front-entrance topiary during the 75-day festival. And that’s just the beginning. 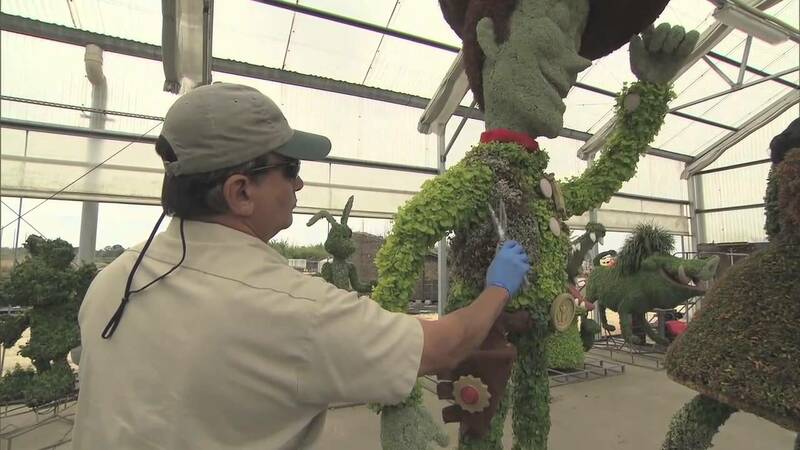 More than 70 topiaries in all showcasing the extraordinary craftsmanship of Disney gardeners will dot the park landscape. Sweeping floral beds and exhibits will feature 30 million blooms. The art of bonsai will “wow” guests at the Japan showcase, and a large “green” garden between the France and Morocco pavilions will reveal the many ways home gardeners can “go green” with their own landscapes.